Do you often end up grabbing fast food, or spending a lot of money going out to eat? Wish your family sat down for meals more often? I know I do ... and that is why I went to Dinner Done last night with my sister-in-law. I have been wanting to go for awhile now and I'm so glad I finally did! Does that sound like a public service announcement? How does it work? First, you schedule a time to go. They only allow so many people to use their "professional" kitchen at a time. Next, you decide how many meals you want to prepare ... and you select your meal choices from the menu. My sister-in-law and I split the 12-meal plan ... she got seven and I got five, which is also something you can do. Once you get to Dinner Done, you have to prepare your meals ... which I love since it allows me to keep the nasty onions out of my meals. They have the kitchen set up in stations ... one station per meal. Each station has all the ingredients you need to prepare your meal ... it is awesome. You do your thing and then move on to the next station ... they clean up your mess! Oh, one more thing ... you can split your meals if you want. For example, one chicken dish is typically four large chicken breasts. So if that is too much for one meal, you can split it into two meals. That is what I did with all five of my meals ... I can always cook two at a time if I need to. So in the end, I got 10 meals for $100 ... not too shabby. For me, the cost is worth it because 1) I don't always have time to cook like this, and 2) we wouldn't normally eat this healthy on a day to day basis ... because we don't always have time to cook like this. Did I say that already? 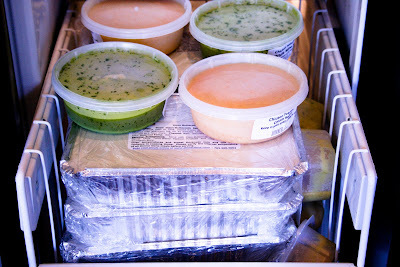 And here is what part of my freezer looks like ... just take it out, thaw and bake. Presto! $10 a meal! That is a great deal. I just found your blog and love it! I'm looking forward to reading more. and what was your food selection? is it for your husband and you? or also de kids? I have done the same thing and loved it! I went with friends to prepare meals and it was a great time! Enjoy your meals!